Chances are that in 1991 if you had any of the ProSet MusiCards you probably also had some of that card set’s funky cousin, the Yo! MTV Raps MusiCards. It seems that on the store counter where you found one, you found the other. The format was the same, music act on the front, informational blurb on the back. The Yo! 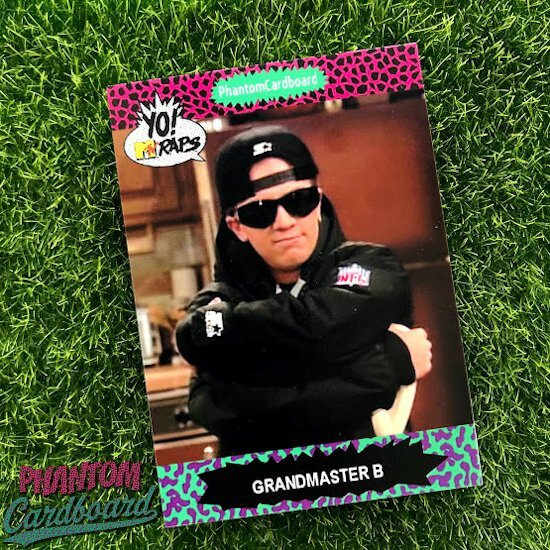 MTV Raps cards featured strictly hip hop acts where as the the regular MusiCards featured popular artists from all genres, a few acts even are featured in both sets. The aesthetic of the Raps cards had a little more going on than the much simpler template of the regular MusiCards. If I didn’t know better I would say it looks like ProSet consulted with Lisa Frank to help this set pop. I’m just freesetyling here but the Yo! MTV Raps cards target audience may have been Suburban America. With Vanilla Ice and M.C Hammer bringing a new demographic into the rap fold these cards introduced hip-hop acts that weren’t as well known as rap and hip-hop culture was experiencing a mainstream boom. Just a theory. Anymore rap is a culture of its own. Hip hop is now multigenerational and is really transcending race. Back in 1991 white rappers, by and large, were mainly novelty acts. For my Yo! cards I wanted to have fun and add some Anglo pop-culture flava from back in the day. If you’ve ever seen 1989’s Teen Witch you are well aware of one of the most pinnacle scenes in movie history; the “Top That” rap battle between Polly and Rhet. I have to believe that scene was the seed that the whole plot of 8 Mile would eventually grow from. If you’re a fan of that gritty street-level lyrical rap and you’ve never seen this scene then stop reading this blog and hit up YouTube. Just type in “Top That”, watch and then come back and finish this post. I read recently that the “Top That!” scene was not even part of the original movie but added months after the movie had wrapped with producers wanting to add a rap feature to the middle of the movie. Both Noah Blake (Rhet) and Mandy Ingber (Polly) each recalled being embarrassed about performing the scene but both went HAM on “Top That!” thinking no one would ever see it. Little did they know that the Internet and a generation heavy on nostalgia would resurrect it into a pop-culture phenomenon. In Season Six (1992) of Married … With Children we were introduced to Bud Bundy’s alter-ego Grandmaster B. For the longest time I thought the producers were using the popularity of rap music at the time as another avenue to put Bud Bundy’s ineptitude with woman on display, which it was, but what I found out only a few years ago was that David Faustino around this time was trying to throw his backwards Raiders cap into the rap game! Faustino, under the moniker D ’Lil, released a single in 1992 called “I Told Ya” and it’s the most early ‘90s rap thing you’ll ever listen to. If you think “Top That!” is cringey then I’d have to believe that the Prince Zack rap from the “1-900-Crushed” episode from Season Two (1990) episode of Saved by the Bell has to be as hard to watch as your grandparents in the throes of a saliva heavy makeout sesh. It makes “Top That!” sound like Eminem’s “Rap God”. The scene comes as a dream sequence of Kelly’s little sister Nikki. 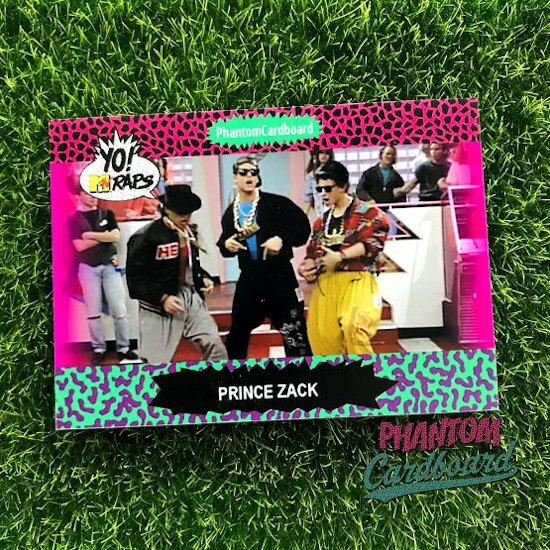 It’s a bastardized rap retelling of Cinderella with Zack as a rapping Prince Charming with Slater and Screech providing the spit-shower beatboxing as Zack tries to find the owner of the golded out hi-top sneaker. Spoiler alert; it fits Nikki Kapowski. After seeing this no wonder it took white people so long to be taken seriously in rap music. But, I jest. I love Saved by the Bell and think this scene is charming in a ridiculous Zack Morris kind of way. 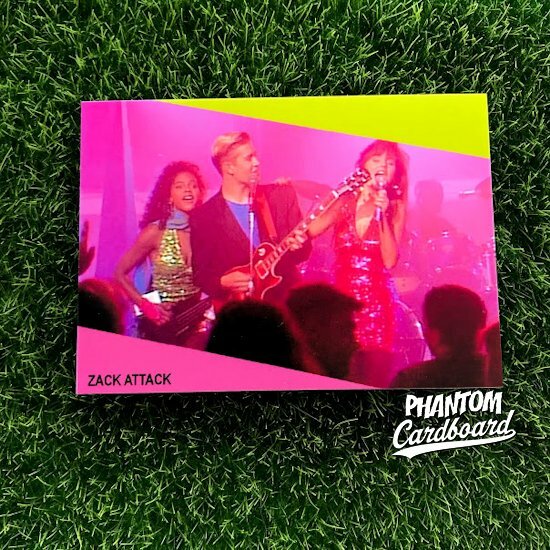 I could not make a fantasy music trading card of Saved by the Bell and not pay tribute to probably the greatest fictional band of all-time, Zack Attack. Correct me if I’m wrong, but didn’t Saved by the Bell basically lay the groundwork for VH1’s Behind The Music series with the Season Three (1991) episode “Rockumentary”? The episode chronicles, again in dream sequence form, the rags-to-riches rise, fall, and eventual reunion of Zack’s powerhouse band “Zack Attack”. I dusted off the two fluorescent oblong triangles of my 1991 ProSet MusiCards inspired design and plugged in Zack, Lisa, and Kelly performing their worldwide smash hit “Friend’s Forever”. Seriously, that episode ruled. The voices in the songs didn’t even remotely match those of the Bayside gang.